What do you see? 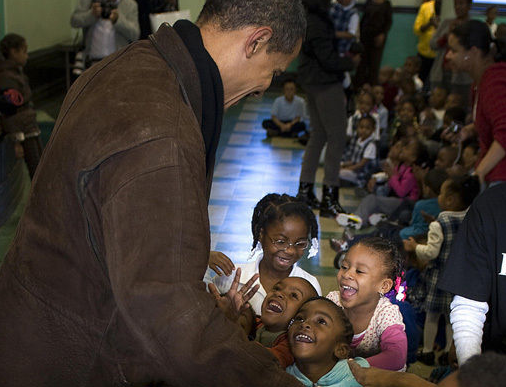 I see some little kids who are really, really excited to see the next President of the United States. Their fresh, smiling faces are full of hope. I want each of these kids to read great books and newspapers, make informed decisions, vote and be responsible for themselves and each other. I want them to go to college, to get good jobs and to always be as happy as they look here. Prez-elect Obama demonstrates that being smart can be cool–book smart is cool, too. He shows that these kids can be true to themselves AND do well in school and that getting an education is not selling-out. The Prez-elect can bring this message all the way home by appointing former Secretary of State and Chair of the Joint Chiefs Colin Powell as his Secretary of Education. It would elevate education to a top-tier department by virtue of General Powell’s star power. You take a high-wattage leader and it shines on the entire department. Powell has been working on youth issues since he founded the America’s Promise Alliance in 1997–including efforts to prevent students dropping out of high-school. Powell’s pragmatism, commitment to public service and leadership certainly makes sense in an Obama administration. Powell, too, has a compelling story–a Harlem native who became the first ROTC officer to chair the Joint Chiefs and counselor to four presidents. Powell gains from this, too. When he endorsed Obama, Powell said, “I think the American people and the gentlemen running for president will have to, early on, focus on education more than we have seen in the campaign so far.” Being Ed. Secretary lets him put his money where his mouth is. Last, joining the cabinet would aid in rehabilitating Powell’s reputation. To be honest, he’s still dirty from the run up to the Iraq War. A high profile gig at Ed would be a great bookend to his public service. I saw the picture above, and fell in love with each of those kids. And I want them to have every opportunity to be great people and great Americans. Let’s put a star at Ed. Gee, do you suppose some of our problems (gangs, shootings, homeless, drugs, vandalism, etc.) just might have something to do with the fact that the Department of Education is considered kind of a “blahsville”, not very important area of government instead of being one of the biggest, most important departments. How much difference would there be 20 to 30 years from now if our country really started to concentrate on improving everything about the school system from early education right on through high school,trade schools and college. Our school system, for the most part, is still in the 19th century when the children needed to be home to help with the crops during the summer months and the 3 R’s were something that got attention only when the important stuff was done. It would be wonderful it someone like Colin Powell could start turning around the education system. I could see a much more promising future for our country if education started getting real attention and not just lip service.